[Free Pattern] This Dachshund Bookmark Is Totally Awesome! I love colors in my kitchen.So, every time I find a pattern that is gorgeous and a mixture of colors, I admire and happily share the pattern. 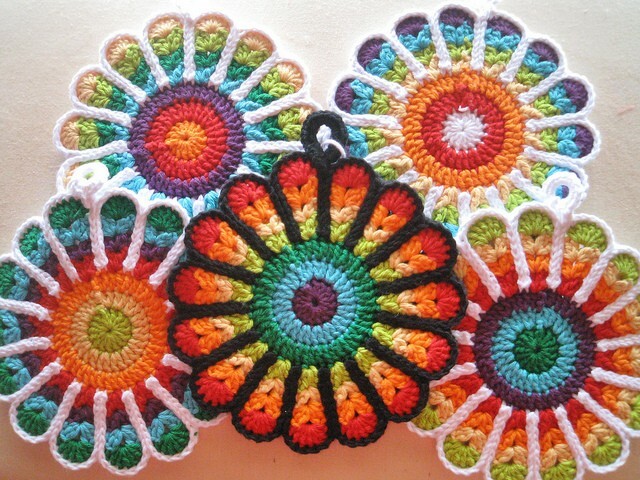 Today is this lovely Flower Potholders by Jennifer Martin. Need potholders in your kitchen? Try these adorable crochet happy flower potholders Easy to make this is a pattern that you won’t get tired of doing again and again .This pattern is addictive! Once you ‘get it’, you won’t be able to stop making them. yarn, repeat row 6 once more and adjust joining instructions accordingly. Thanks to Jennifer for this article inspiration and featured image. how do you get the pattern? Hi Carol, please click the name of the pattern. Where it says: “Today is this lovely Flower Potholders by Jennifer Martin.” please click the Flower Potholder link. Hope it helps! These are awesome. My daughter would love these in her kitchen. Oh, I need to make these!!! I love these bright colors! Pattern please. Can’t bring it up. Daisies are my most favorite flower in the whole entire world! Love these! Beautiful – Like a bouquet of flowers. This is one of my favorite patterns. So easy and looks so great! Grandma used to make these. Aren’t those neat! Love the colors!! I made these as Christmas presents for work associates one year a long long time ago. These are so bright and colorful, Michelle Pecanic-Lee. They’d go great in your kitchen. These are neat Rose Vadnais! DailyCrochet.com. Your patterns are still not working. They keep timing out. No connection found. Adorable! Thanks for sharing Lena! Pretty looks hard to make? Arianne Ozolins. These sure are pretty! Does any individual recognize the right 100% percent acrylic yarns that are available? So, cotton yarns are the way to go? This is sooo beautiful! Id love it as a gift!! !